As a Motorcharge cardholder you enjoy many benefits designed to save you time and money! Lube Mobile are now making servicing & maintaining your fleet vehicles simple and easy too! Motorcharge cardholders also enjoy a special discount of 7% off all work completed. Simple, easy & affordable - the way car servicing should be! 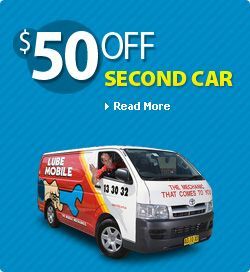 Call us today on 13 30 32 and simply mention 'Motorcharge' to receive your special discount. We will have a mechanic on his way at a time and place that is convenient for you! Click here to download our Motorcharge Partner Offer PDF or visit the Motorcharge official website.